Years ago, my mother was ill in the hospital before she passed away. One day I visited her and read aloud a short story I had written about Ireland – and which had been accepted for publication. The book publisher (Travelers’ Tales, of San Francisco) had sent their formatted galleys in case I wanted to make any last minute revisions. I read the piece aloud. She listened for cadence and substance, then suggested one or two modifications before nodding her head that it was good to go. I still appreciate her input and attention to rhythm. This true story is about riding a bicycle in western Ireland to an amazing old stone fort named Dun Aengus. It’s also about how landscapes alter our perception of time, and how time can enhance how we appreciate the places we visit. The book includes stories by Frank McCourt, Nuala O’Faolain, Colm Tóibín, Maeve Binchy, and Rosemary Mahoney. I still feel proud to be included in this anthology. This bicycle trip in western Ireland helped inspire me to write – years later – a book that weaves historical fact with fiction to produce a tale spanning five millennia of Irish history. Titled River of Ireland, the book tells of Viking raiders, warring chiefs, crafty politicians, romantic musicians, and a brave Spanish Armada captain – all who helped shape the character of Ireland’s culture. Read the short piece titled – Cycling to Dun Aengus. 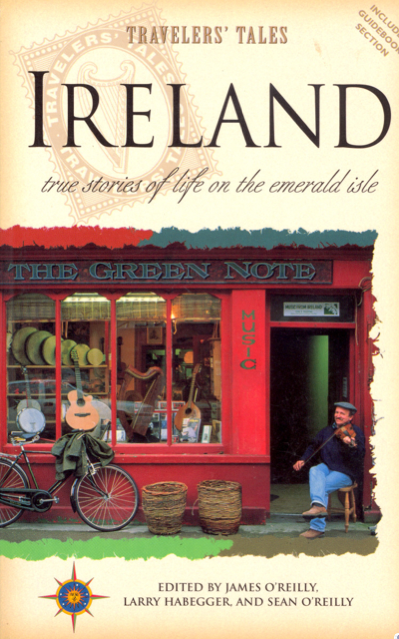 Read about the book Traveler’s Tales – Ireland. Read more about the book River of Ireland. As the Gaelic saying goes, An té a bhíónn siúlach, bíonn scéalach. Or – who travels has stories to tell. Check out this recent New York Times article about another desolate, windswept sanctuary for worship off the west coast of Ireland, called Skellig Michael. Or check out this YouTube video of Dun Aengus. There’s not much of a structure left – but you can imagine looking out from a fortress toward a wild ocean view.